A seven-year-old boy died on the spot while the bike he was riding pillion was trying to cross the road with another two-wheeler on its side, one person was injured on Monday evening on college road near Sanman hotel. Akmal Mushtafa Sheikh, 7, a resident of Srinagar Belagavi was killed on the spot while Ashok Anil Sheri, 31, of Konwal Galli was injured. 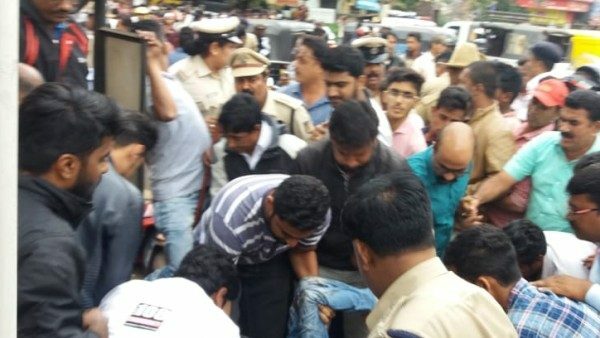 Accident occurred when a car was going from Chatrapati Sambhaji Chowk towards Rani Chennamma Circle, two bikes were trying to cross the road from Sardars Ground side towards Sanman dashed each other and the boy was caught in the same and killed on the spot. When the car hit a motorcycle Akmal who was riding pillion fell down and hit the divider. The rider of the bike was minorly injured while another biker has some more grievous injuries who have been admitted to hospital. A part of credit goes to Belagavi Traffic Cops too as system seems to be outdated and poor in action against culprits. Make a system like bengaluru city. Many accidents have taken place at this location.There is huge traffic congestion due to functions taking place at Gandhi Bhavan,Two wheelers and Autos Comming on the wrong side from MVM School,RLS,People going to Sanman Petrol Pump,Parking throughout the Road.The Authorities should plan entirely stop the crossing like they did at first gate only then people will stop taking shortcuts. People please take a detour there are no short cuts if you do it some one else will do and another one and Soo on. The TRAFFIC police have totally failed in their duties, they just want easy money by posting themselves in one corner of road & catching citizen’s who are not wearing Helmet, they are least bothered about trillion rider’s or reckless drivers or speed limit, there will be no end to this until police comm. comes up with a solution. Need to put Signal lights on that Road And same Road breaker’s too. It is high time the crossings on this road should be closed. People have forgotten value of life! Like many other incidents this too will be soon forgotten and traffic violations will return to normal till another tragedy strikes!